If picking the GOP primary debate winner depended on who was funniest, then Sen. Lindsey Graham would probably have won this latest one with his comment about drinking. But if the senator managed to win the White House, who would Graham's drinking buddies be? Whoever they are, it would probably be the political event of the season. Graham's joke isn't totally out of left field. It came as the senator sought to prove that he would be willing to compromise and work with Congress. During the debate, Graham referenced Ronald Reagan's willingness to work with the opposing party. "He sat down with Tip O'Neill, the most liberal guy in the entire house. They started drinking together. That's the first thing I'm going to do as president: We're going to drink more." 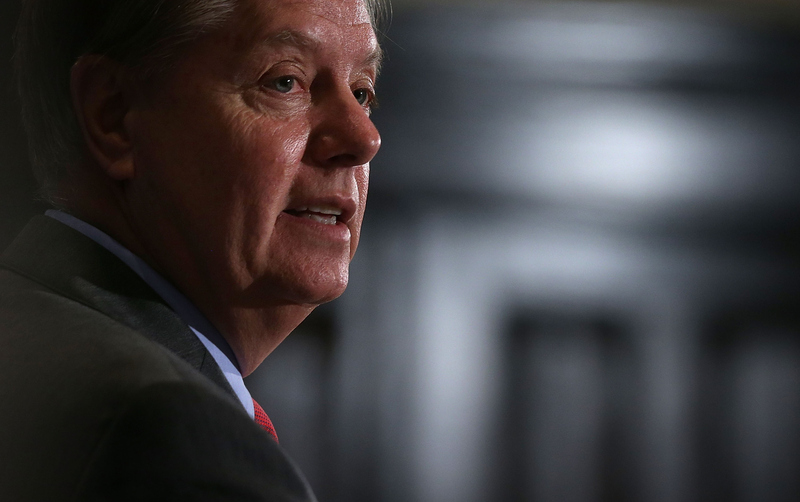 It's not a new line for Graham, who has stated his desire for more drinking in D.C. before. Liquor appears to be his tool of choice for working out nasty disputes. “After a few drinks, we’re going to stop the B.S. and work together,” he said during a speech at the Iowa State Fair in August. But who cares if it's an old line? It's a good one. And we've got a hunch that there are a few people who would love to drink with Graham. Who said that only Democrats can play drinking games? No need for Graham to start drinking when he gets to the White House. He should go ahead and invite all of the other Republican presidential candidates over to his pad to have a rousing good time while watching the Democratic primary debate in October. Graham likes to drink, and so does Ruth Bader Ginsburg. She's claimed that she's laying off of wine this year, after falling asleep at the State of the Union. Admittedly, it would probably be a very quiet, subdued drinking party, but one that you could probably sell tickets to. Graham has a lot of respect for Reagan because he sat down with the most liberal guy in Congress. Sanders may not be the most liberal, but being a self-proclaimed socialist seems good enough. Sanders seems like the type of guy who would probably be totally down with a drinking compromise as well. So far, the two have been the popular winners of the happy hour debates, so it makes sense that they should hang out. The two of them could get a drink, chill, and plan how to take over the larger Republican Party. Together, they could be a terrifyingly effective combination. Let's pretend for a moment that George Washington isn't extremely dead. Washington was the original drunk president. The man loved his booze, and like Graham, his campaign included promises that the nation would drink more. Washington would probably be proud of Graham's honesty. Admittedly, the thought of a drunk Donald Trump is mildly terrifying. But imagine if the loudmouth Trump and the soft-spoken Graham got drunk together. Maybe Graham could prove his ability to compromise by talking Trump down from some of his more interesting campaign points. And if all else fails, it would probably let Graham get some pent up animosity out after that phone incident. Even if Graham doesn't make it all the way to the White House, that doesn't mean he can't have a good time with his fellow politicians. And I have a feeling that several people who took to the GOP debate stage tonight would be more than happy to drink with him — especially if they lose the nomination to Trump.